"A post-Ensnared collection of three stories—available in both print and e-versions. This collection expands upon Ensnared's epilogue, and includes some deleted scenes to provide a “director’s cut” glimpse into the past and futures of our favorite Splintered characters." This was a fun little extra for fans of the Splintered series. I had already read Moth In The Mirror when it originally released and really enjoyed it. So with Untamed, I only read The Boy In The Web and Six Impossible Things. I wasn’t the biggest fan of The Boy In The Web. This one is told from Alison’s (Alyssa’s Mom) point of view and I just don’t love Alison. She has never been my favorite. This one also didn’t really give us anything new; we all kinda knew this already. It was a fun read but I was a bit meh on it. As for Six Impossible Things, this one was fun and was what I was looking for from Untamed. This story dove into six of Alyssa’s memories; three with Jeb and three with Morpheus. The Jeb ones were okay but I ADORED the Morpheus ones. If I’m being honest, those memories are what I was most looking for out of these novellas. I wanted to see some more Morpheus and Alyssa and I wanted a peek into their happily ever after. I will forever love Morpheus and I ate up every bit of his presence. 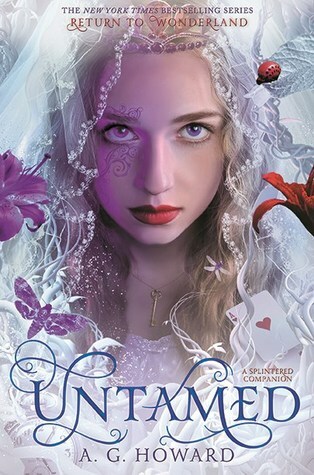 So all in all, Untamed was a fun little trip back to Wonderland for fans of the series. I haven't read any of these but I absolutely love the covers on these- they're so nice.